X It is small but rough and tough. It won’t hesitate to take a bite out of anything that moves. X Es ist klein, aber zäh und stark. Es zögert nicht, jeden anzugreifen, wenn dieser ihm zu nahe kommt. X Petit mais costaud, il n’hésite pas à mordre tout ce qui passe à portée de ses dents. X Es pequeño pero violento. No dudará en morder cualquier cosa que se mueva cerca. X Piccolo, ma forte e deciso. Non esita ad avventarsi su qualsiasi cosa si muova. X 작아도 성격은 아주 거칠다. 눈앞에서 움직이는 것이 있으면 무조건 물어버린다. Y Its powerful, well-developed jaws are capable of crushing anything. Even its Trainer must be careful. Y Seine starken Kiefer können alles zermalmen. Selbst sein Trainer muss sich vor ihm in Acht nehmen. Y Sa mâchoire surdéveloppée est capable de tout broyer. Même son Dresseur doit s’en méfier. Y Sus desarrolladas y potentes fauces pueden romper cualquier cosa. Su Entrenador debe tener cuidado. Y Le sue potenti mandibole possono frantumare qualsiasi cosa. Anche l’Allenatore dev’essere cauto. Y 발달한 턱은 파워풀해서 뭐든지 깨물어 부수기 때문에 어버이 트레이너라도 주의해야 한다. 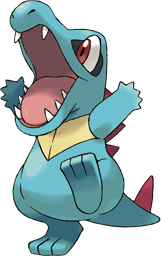 Omega Ruby Despite the smallness of its body, Totodile’s jaws are very powerful. While the Pokémon may think it is just playfully nipping, its bite has enough power to cause serious injury. Omega Ruby Karnimani ist zwar sehr klein, aber seine Kiefer sind sehr stark. Wenn die Pokémon denken, dass es nur spielerisch an ihnen knabbert, sollten sie vorsichtig sein, denn sein Biss kann zu schweren Verletzungen führen. Omega Ruby Malgré son tout petit corps, la mâchoire de Kaiminus est très puissante. Parfois, ce Pokémon mordille les gens pour jouer, sans se rendre compte que sa morsure peut gravement blesser quelqu’un. Omega Ruby Totodile tiene cuerpo pequeño, pero fuertes mandíbulas. A veces, piensa que solo está dando un mordisquito y hace unas heridas bastante considerables. Omega Ruby Nonostante il suo corpicino minuto, le mascelle di Totodile sono molto potenti. Sebbene creda solo di giocare, il suo morso è così forte e pericoloso da causare serie ferite. Omega Ruby 몸은 작지만 턱의 힘은 강하다. 리아코 나름은 살포시 물려고 하지만 큰 상처를 입힐 정도의 힘이 있다. 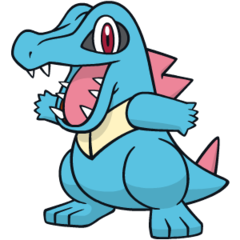 Alpha Sapphire Despite the smallness of its body, Totodile’s jaws are very powerful. While the Pokémon may think it is just playfully nipping, its bite has enough power to cause serious injury. Alpha Sapphire Karnimani ist zwar sehr klein, aber seine Kiefer sind sehr stark. Wenn die Pokémon denken, dass es nur spielerisch an ihnen knabbert, sollten sie vorsichtig sein, denn sein Biss kann zu schweren Verletzungen führen. Alpha Sapphire Malgré son tout petit corps, la mâchoire de Kaiminus est très puissante. Parfois, ce Pokémon mordille les gens pour jouer, sans se rendre compte que sa morsure peut gravement blesser quelqu’un. Alpha Sapphire Totodile tiene cuerpo pequeño, pero fuertes mandíbulas. A veces, piensa que solo está dando un mordisquito y hace unas heridas bastante considerables. Alpha Sapphire Nonostante il suo corpicino minuto, le mascelle di Totodile sono molto potenti. Sebbene creda solo di giocare, il suo morso è così forte e pericoloso da causare serie ferite. Alpha Sapphire 몸은 작지만 턱의 힘은 강하다. 리아코 나름은 살포시 물려고 하지만 큰 상처를 입힐 정도의 힘이 있다. Gold Its well-developed jaws are powerful and capable of crushing anything. Even its trainer must be careful. Silver It is small but rough and tough. It won't hesitate to take a big bite out of anything that moves. Stadium2 Its well-developed jaws are powerful and capable of crushing anything. Even its Trainer must be careful. Ruby Despite the smallness of its body, Totodile's jaws are very powerful. While the Pokemon may think it is just playfully nipping, its bite has enough power to cause serious injury. Sapphire Despite the smallness of its body, TOTODILE's jaws are very powerful. While the POKeMON may think it is just playfully nipping, its bite has enough power to cause serious injury. Emerald Despite its small body, TOTODILE's jaws are very powerful. While it may think it is just playfully nipping, its bite has enough strength to cause serious injury. Diamond It has the habit of biting anything with its developed jaws. Even its Trainer needs to be careful. Pearl It has the habit of biting anything with its developed jaws. Even its Trainer needs to be careful. Platinum It has the habit of biting anything with its developed jaws. Even its Trainer needs to be careful. SoulSilver It is small but rough and tough. It won’t hesitate to take a bite out of anything that moves. Black It has the habit of biting anything with its developed jaws. Even its Trainer needs to be careful. White It has the habit of biting anything with its developed jaws. Even its Trainer needs to be careful. White 2 It has the habit of biting anything with its developed jaws. Even its Trainer needs to be careful.